One of the most popular and versatile annual flowers worldwide is the marigold. They are grown in gardens as bedding plants and in window boxes as well as balconies around the world. Marigolds will bloom continuously from seedling size all through summer up to a killing frost. The primary color is yellow to maroon and can be any shade in between such as orange, rust and burgundy. Many flowers are multi colored or have a complimentary color on the edges and undersides of the petals. The majority of older varieties of marigolds have a distinct fragrance which some people find objectionable. However, the newer types have hardly any odor at all. Most people don't even think about cutting marigolds for indoor decoration. They last almost indefinitely if you provide fresh water daily. In addition, cutting the flowers will benefit your plants in the garden. There is a large variety of sizes and petal shapes to select from. The smallest are the dwarf French marigolds which grow less than a foot in height. These are available in both single and double flowering types and are ideal for borders and edging. The largest marigold cultivars produce giant flowers up to 5 and 6 inches across on tall bushy plants. These make wonderful specimen or background plantings. 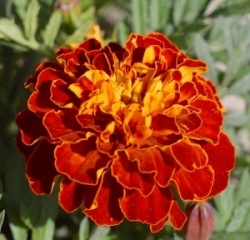 All marigolds are easy to grow from seed and will bloom within 2 months. Keep spent blossoms picked off to encourage more flowers and new growth. Marigolds can also be propagated by stem cuttings and root quite readily in water or moist sand or vermiculite. Remove spent blossoms by pinching them off between thumb and forefinger. This will encourage branching and more flowers. Marigolds are relatively pest free except for occasional chewing insects, leaf miners and spider mites. Spider mites are very aggressive and can kill a marigold (or any other annual plant for that matter) within a few days. You will need to spray with a miticide on a regular basis to keep them under control. The plants do best in full sun and improved soil. Keep moist and feed monthly with a general purpose 6-6-6 fertilizer.